Activation of the G protein-coupled receptor (GPR)40 by long-chain fatty acids potentiates glucose-stimulated insulin secretion (GSIS) from pancreatic beta cells, and GPR40 agonists are in clinical development for type 2 diabetes therapy. GPR40 couples to the G protein subunit Gαq/11 but the signalling cascade activated downstream is unknown. This study aimed to determine the mechanisms of GPR40-dependent potentiation of GSIS by fatty acids. Insulin secretion in response to glucose, oleate or diacylglycerol (DAG) was assessed in dynamic perifusions and static incubations in islets from wild-type (WT) and Gpr40 −/− mice. Depolymerisation of filamentous actin (F-actin) was visualised by phalloidin staining and epifluorescence. Pharmacological and molecular approaches were used to ascertain the roles of protein kinase D (PKD) and protein kinase C delta in GPR40-mediated potentiation of GSIS. Oleate potentiates the second phase of GSIS, and this effect is largely dependent upon GPR40. Accordingly, oleate induces rapid F-actin remodelling in WT but not in Gpr40 −/− islets. Exogenous DAG potentiates GSIS in both WT and Gpr40 −/− islets. Oleate induces PKD phosphorylation at residues Ser-744/748 and Ser-916 in WT but not Gpr40 −/− islets. Importantly, oleate-induced F-actin depolymerisation and potentiation of GSIS are lost upon pharmacological inhibition of PKD1 or deletion of Prkd1. We conclude that the signalling cascade downstream of GPR40 activation by fatty acids involves activation of PKD1, F-actin depolymerisation and potentiation of second-phase insulin secretion. These results provide important information on the mechanisms of action of GPR40, a novel drug target for type 2 diabetes. The online version of this article (doi: 10.1007/s00125-012-2650-x) contains peer-reviewed but unedited supplementary material, which is available to authorised users. Diabetes is reaching pandemic proportions throughout the world and is expected to affect over 550 million people worldwide in 2030 . The most common form of the disease, type 2 diabetes, occurs when pancreatic beta cells are unable to secrete an adequate amount of insulin to compensate for peripheral insulin resistance . Insulin secretion is regulated chiefly by glucose through intracellular metabolism of the sugar, and is additionally modulated by non-glucose secretagogues such as incretin hormones, fatty acids and muscarinic stimulation via G protein-coupled receptors (GPCRs) . Since activation of these receptors augments insulin secretion only when glucose levels are elevated, they can be targeted therapeutically to enhance insulin levels with minimal risks of iatrogenic hypoglycaemia. G protein-coupled receptor 40 (FFAR1/GPR40) is a GPCR activated by medium- to long-chain fatty acids and predominantly found in pancreatic beta cells [4, 5, 6]. Deletion of Gpr40 markedly reduces the potentiation of glucose-induced insulin secretion (GSIS) by fatty acids both in vivo and in isolated islets [4, 7, 8, 9]. Conversely, both transgenic overexpression of Gpr40 in beta cells  and administration of GPR40 agonists enhance insulin secretion in rodents [11, 12, 13]. Importantly, we [7, 14] and others [15, 16, 17] have shown that GPR40 does not mediate the lipotoxic effects of chronically elevated fatty acid levels on pancreatic beta cell function. Collectively, these observations provide a strong rationale for the development of GPR40 agonists for the treatment of type 2 diabetes. Indeed, the recently released results of a phase 2 clinical trial of the agonist compound TAK-875 showed very promising efficacy [18, 19]. Despite recent progress made towards the development of GPR40-based drugs for type 2 diabetes, surprisingly little is known regarding the mechanism of action of the receptor. The insensitivity of GPR40 signalling to pertussis toxin  and its sensitivity to pharmacological inhibitors of the G protein subunit Gαq/11 and phospholipase C (PLC) [5, 7] suggest that GPR40 is coupled to Gαq/11, although coupling via Gαi has also been suggested . Gαq/11 typically signals through PLC-mediated hydrolysis of membrane phospholipids and the generation of inositol 1,4,5-trisphosphate (IP3) and diacylglycerol (DAG). Although IP3 levels in islets increase in response to fatty acids in a GPR40-dependent manner , the functional importance of endoplasmic reticulum (ER) Ca2+ stores remains unclear  and, to our knowledge, the contribution of the DAG branch of the pathway to GPR40 signalling has not been tested. In addition, the nature of the signalling kinase(s) activated downstream of GPR40 and which mediate the insulin secretory response to fatty acids remains unknown. As GPR40 agonists are under clinical development to become novel type 2 diabetes drugs, it is critical to better understand the signalling mechanisms of the receptor. Therefore, this study aimed to determine: (1) the kinetics of the potentiation of GSIS by fatty acids via GPR40 in isolated mouse islets; (2) the cellular events underlying this effect and (3) the signalling molecules activated downstream of GPR40 in the beta cell. RPMI-1640 and FBS were from Invitrogen (Burlington, ON, Canada). Adenoviruses encoding IRES-GFP (Ad-GFP) and Cre-IRES-GFP (Ad-Cre) were kindly provided by J. Estall, Institut de Recherches Cliniques de Montreal, Montreal, QC, Canada. Antibodies against protein kinase D (PKD) (phospho-serine 744/748, phospho-serine 916 and total PKD1) were from Cell Signal (Pickering, ON, Canada). 1,2-Dioctanoyl-glycerol (8:0) was from Enzo Life Science (Brockville, ON, Canada). Oleic acid and 3-isobutyl-1-methylxanthine (IBMX) were from Sigma (St Louis, MO, USA). Rottlerin was from Calbiochem (Gibbstown, NJ, USA). Gpr40 −/− mice, whole-body PKC δ-null (Prkcd −/−) mice and mice bearing a protein kinase D1 allele flanked by Lox-P sites (Prkd1 flox/flox) were generated as respectively described [7, 22, 23]. Wild-type (WT) littermates were used as controls. Mouse islets were isolated by hand-picking after collagenase digestion of the pancreas as described , and maintained overnight in RPMI-1640 supplemented with 10% (wt/vol.) FBS, 100 U/ml penicillin–streptomycin and 11 mmol/l glucose. All procedures were approved by the institutional committee for the protection of animals at the Centre Hospitalier de l'Université de Montréal. The rat insulin-secreting cell line INS832/13 was cultured in RPMI1640 medium supplemented with 11 mmol/l glucose, 10% (wt/vol.) FBS, 10 mmol/l HEPES (pH 7.4), 1 mmol/l sodium pyruvate and 50 μmol/l β-mercaptoethanol. Islet perifusions were performed as described  with the following modifications: after a 20-min equilibration period with KRB solution containing 0.1% (wt/vol.) BSA and 2.8 mmol/l glucose, islets were perifused for 40 min with 16.7 mmol/l glucose with or without 0.5 mmol/l oleate. Oleate was pre-complexed for 1 h at 37°C with fatty-acid-free BSA to a final molar ratio of 1:5 as described . Control conditions contained the same amount of BSA and vehicle (50% [vol./vol.] ethanol). For static incubations, batches of ten islets each were starved twice in KRB solution containing 0.1% (wt/vol.) BSA and 2.8 mmol/l glucose for 20 min at 37°C, then incubated for 1 h in the presence of various secretagogues as described in Results. Each condition was run in triplicate. Intracellular insulin content was measured after acid–alcohol extraction. Insulin was measured by radioimmunoassay using rat insulin RIA kit (Millipore, Billerica, MA, USA). Mouse islets were infected with adenoviruses after partial dissociation to ensure penetration of the viruses into the islet core. After isolation, the islets were washed twice with 1 ml dissociation buffer (1× Hank’s balanced salt solution (HBSS), 20 mmol/l HEPES, 5 mmol/l glucose and 1 mmol/l EGTA), and incubated for 3 min at 37°C with 0.5 ml dissociating buffer. Islets were then infected with 2 × 107 plaque-forming units (pfu)/(100 islets) of adenoviruses for 24 h, after which the medium was replaced with complete medium and cultured for an additional 4 days in a humidified atmosphere with 5% CO2 at 37°C. Mouse islets were dispersed into single cells by incubation for 11 min at 37°C in calcium-free buffer followed by gentle trituration with a flame-polished glass pipette, and then the cells were attached overnight to a coverslip. The cells were starved for 1 h in KRB (1 mmol/l glucose and 0.1% (wt/vol.) BSA), followed by incubation at indicated conditions. Next, cells were fixed with Z-FIX (Anatech, Battle Creek, MI, USA) and stained for insulin (rabbit anti-insulin primary antibody; Santa Cruz Biotechnology, Santa Cruz, CA, USA; and Alexa Fluor 594- or Alexa Fluor 350-conjugated goat anti-rabbit secondary antibody; Invitrogen) and for filamentous actin (F-actin) (Alexa Fluor 488- or Alexa Fluor 565-conjugated phalloidin; Invitrogen). Cells were imaged with a Zeiss Axio Observer.Z1 microscope and ×63 Plan ApoChromat objective (1.4 NA). Excitation was with a COLIBRITM (Carl Zeiss Canada, Toronto, ON, Canada) LED light source with 350, 495 or 555 nm filter set. Insulin-positive cells were used for F-actin intensity measurement. INS832/13 cells were washed with cold PBS 1X and homogenised at 4°C in buffer A (20 mmol/l Tris-HCl, pH 7.5/2 mmol/l EDTA. 0.5 mmol/l EGTA, 1 mmol/l phenylmethylsulfonyl fluoride, 25 μg/ml leupeptin, 0.1 mg/ml aprotinin and 0.33 mol/l sucrose) and centrifuged at 1,000 g for 10 min. The supernatant fraction was ultracentrifuged at 100,000 g for 30 min at 4°C and the resultant supernatant fraction was retained as the cytosolic fraction. The pellets were washed and resuspended in buffer B (buffer A without sucrose) and homogenised again. The homogenates were solubilised in buffer B with 1% (wt/vol.) Triton X-100. After incubating for 45 min, soluble fractions were obtained by ultracentrifugation at 100,000 g for 30 min and were retained as membrane fractions. Protein extracts were separated on 7.5% (wt/vol.) SDS–PAGE, blotted to nitrocellulose membranes, incubated overnight at 4°C with primary antibodies and visualised with horseradish peroxidase-labelled anti-rabbit or anti-mouse IgG as secondary antibodies. Bands were quantified by ImageJ software (http://rsbweb.nih.gov/ij/). The method for quantitative RT-PCR and list of primers are described in electronic supplementary materials (ESM) Methods. Data are expressed as mean ± SEM and were analysed by one or two-way ANOVA with Bonferroni post-hoc adjustment for multiple comparisons, or Student’s paired t test, where appropriate. p < 0.05 was considered significant. Fatty acids are known to potentiate GSIS via both GPR40-dependent and -independent pathways. To determine the kinetics of the potentiation of GSIS by fatty acids and the contribution of GPR40 to phasic insulin release, insulin secretion was measured in perifusion experiments from islets isolated from Gpr40 −/− mice and WT littermates in response to 16.7 mmol/l glucose in the presence or absence of 0.5 mmol/l oleate (Fig. 1a, b). We observed that GSIS was similar between WT and Gpr40 −/− islets. The addition of oleate greatly potentiated the glucose response in islets from WT mice (AUC: 1.6 ± 0.3 vs 0.3 ± 0.1 arbitrary units, n = 4, p < 0.001), and essentially restored a large second phase of insulin secretion. Oleate potentiation of GSIS was strongly reduced in islets from Gpr40 −/− mice (AUC: 0.7 ± 0.1 vs 1.6 ± 0.3 arbitrary units, n = 4, p < 0.001). These results indicate that oleate potentiates predominantly the second phase of GSIS and that GPR40 mediates more than half of this effect. Potentiation of insulin secretion is associated, if not directly enabled, by reorganisation of the cytoskeleton to promote access of secretory granules to the plasma membrane . Based on the predominant stimulation of second-phase GSIS by fatty acids (Fig. 1a, b), we examined the effects of oleate on cortical actin depolymerisation. After incubation in 16.7 mmol/l glucose with or without 0.5 mmol/l oleate, single beta cells from WT and Gpr40 −/− mice were fixed and stained for insulin and F-actin and visualised by epifluorescence microscopy (Fig. 2a, b). Under non-stimulatory conditions, F-actin staining appeared as a ring in close proximity to the plasma membrane (Fig. 2a). As expected, glucose time-dependently induced F-actin depolymerisation (shown in Fig. 2a by the disappearance of the ring-shaped F-actin staining) in both WT and Gpr40 −/− beta cells. Oleate rapidly reduced F-actin intensity in WT beta cells, but was ineffective in Gpr40 −/− beta cells after 5 min of incubation, whereas the depolymerising agent latrunculin was equally effective in beta cells from both genotypes. After 15 min of incubation with oleate, F-actin intensity was decreased by about 15%, consistent with the observation that oleate retained some ability to potentiate GSIS in the absence of GPR40 (Fig. 1a), an effect likely due to intracellular metabolism of fatty acids . Thus, oleate promotes rapid F-actin depolymerisation in a GPR40-dependent manner. To test the involvement of the DAG branch of GPR40 signalling on insulin secretion, we exposed isolated islets from WT and Gpr40 −/− mice to glucose in the absence or presence of oleate and/or the cell-permeable 1,2-dioctanoyl-DAG (100 μmol/l; Fig. 3a, b). In WT islets, exogenous DAG had no effect on insulin secretion at basal glucose concentration but potentiated GSIS to a similar level as oleate. The stimulation of GSIS by DAG was not additive to that of oleate (Fig. 3a). 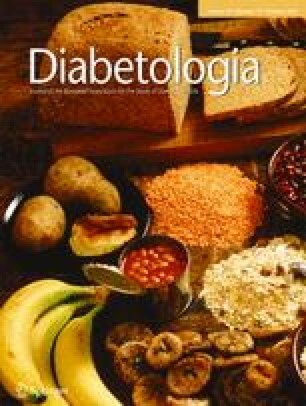 In contrast, the cAMP-raising agent IBMX (100 μmol/l) further potentiated insulin secretion induced by glucose and oleate (Fig. 3c), excluding the possibility that the maximal secretory capacity had been reached with oleate. In Gpr40 −/− islets oleate did not potentiate GSIS but the effect of DAG was preserved (Fig. 3b). These results are consistent with the possibility that DAG acts as a signalling molecule downstream of GPR40. PKD is a DAG-sensitive kinase involved in the regulation of insulin secretion in response to the M3-muscarinic receptor [28, 29]. There are three isoforms of PKD (PKD1–3) encoded by three different genes. Of these, we found PKD1 to be the most abundantly produced at the mRNA level in isolated mouse islets (ESM Fig. 1a). Also, PKD1 protein was readily detected in islets but undetectable in pancreatic exocrine cells (ESM Fig. 1b). In response to Gαq/11 stimulation, DAG binding to the C1 domain of PKD1 promotes its translocation to the plasma membrane  and its activation by sequential phosphorylation at Ser-744 and Ser-748 in the activation loop and autophosphorylation at Ser-916, which promotes the full catalytic activity of the kinase . We observed that incubation of INS832/13 cells with oleate induced rapid PKD phosphorylation at both Ser-744/748 and Ser-916 with no changes in total PKD1 levels in whole-cell extracts (Fig. 4a). The effect was detected at 5 min, reached a maximum at 20 min, remained stable for 1 h for Ser-744/748, and decreased thereafter for Ser-916 (Fig. 4b, c). Exogenous DAG induced PKD phosphorylation to similar degree as oleate. Cellular fractionation showed that phospho-Ser-744/748 was undetectable in the cytoplasmic fraction but increased in the membrane fraction in response to oleate or DAG (Fig. 4d, f). Interestingly, total PKD1 levels also increased at the membrane in response to oleate or DAG, suggesting translocation of the enzyme. Phosphorylation of PKD at both Ser-744/748 and Ser-916 in response to oleate was completely abolished in Gpr40 −/− islets (Fig. 4g). In contrast, exogenous DAG was equally effective in WT and Gpr40 −/− islets. Altogether, these data show that oleate activates PKD in a GPR40-dependent manner, and suggest that this effect might be mediated by intracellular DAG. We used pharmacological and molecular approaches to assess the functional role of PKD1 in the potentiation of GSIS by oleate in 1-h static incubations in islets. First, the PKD inhibitor rottlerin (10 μmol/l, Fig. 5a, inset) completely blocked the potentiating effect of oleate (p < 0.001) in WT islets (Fig. 5a). Second, isolated islets from Prkd1 flox/flox mice were infected with Ad-Cre or Ad-GFP as a control. Ad-Cre-infected islets had a ~75% reduction in PKD1 protein levels (Fig. 5b, inset) and a marked reduction in the potentiation of GSIS by oleate, without significant changes in GSIS (Fig. 5b). PKCδ is a DAG-activated isoform of PKC that is also inhibited by rottlerin and has been suggested to phosphorylate PKD at Ser-744/748 . Therefore, we assessed the potential involvement of PKCδ in GPR40 signalling by measuring insulin secretion in islets from Prkcd −/− mice (Fig. 5c). We observed that both GSIS and its potentiation by oleate were completely preserved in Prkcd −/− islets (Fig. 5c). Altogether, these results indicate that PKD1, but not PKCδ, is required for the potentiation of GSIS by oleate. To assess the involvement of PKD1 in GPR40-mediated F-actin depolymerisation, single beta cells from Prkd1 flox/flox islets infected with Ad-Cre or Ad-GFP were incubated with 16.7 mmol/l glucose in the presence or absence of oleate for 5 min (Fig. 6a, b). Oleate induced F-actin depolymerisation in Ad-GFP-infected beta cells, but this effect was completely abrogated in Ad-Cre-infected beta cells. The effects of glucose and the depolymerising agent latrunculin were unaltered by PKD1 deletion. These results demonstrate that PKD1 is necessary for oleate to promote F-actin depolymerisation. The aim of this study was to identify the signalling pathway activated downstream of the fatty-acid receptor GPR40 in pancreatic beta cells. We found that oleate potentiates preferentially the second phase of GSIS, largely through GPR40. This effect is associated with rapid and GPR40-dependent F-actin depolymerisation and activation of PKD. Further, pharmacological inhibition or deletion of the gene encoding PKD1, but not PKCδ, blocks fatty-acid potentiation of GSIS. Finally, deletion of the gene encoding PKD1 blocks the ability of oleate to induce F-actin depolymerisation. These results uniquely demonstrate that PKD1 is activated downstream of GPR40 and is required for the potentiation of insulin secretion by fatty acids. Since its deorphanisation as a GPCR activated by medium- to long-chain fatty acids [4, 5, 6], GPR40 received considerable attention as potential target for type 2 diabetes therapy. The druggability of GPCRs in general, the relative selectivity of GPR40 production in beta cells, and the ‘incretin-like’ effects of long-chain fatty acids, which only stimulate insulin secretion when glucose levels are elevated, all favour the development of GPR40 agonists to enhance insulin secretion in type 2 diabetes without the risk of hypoglycaemia [4, 5]. However, because prolonged exposure to elevated levels of fatty acids is detrimental to beta cell function , the possibility that chronic stimulation of GPR40 might be deleterious led some groups to propose that GPR40 antagonists—rather than agonists—should be designed for therapeutic purposes [34, 35]. Thus, Steneberg et al  reported that Gpr40 −/− mice are protected from high-fat-diet-induced insulin resistance and glucose intolerance and that transgenic overexpression of GPR40 in beta cells impairs insulin secretion. However, subsequent studies in Gpr40 −/− [14, 16] and transgenic mice  or using GPR40 agonists [11, 12, 13] all concur to support the agonist approach. In fact, several GPR40 agonists are under clinical development, and one of them showed very promising results in a phase 2 clinical trial [18, 19]. Despite the intense interest in the pharmacology of GPR40 as a therapeutic target, comparatively little is known about the biology of the receptor. In this study we first examined the kinetics of fatty-acid effects on GSIS in perifusion experiments. As expected, in mouse islets  the response to glucose was biphasic: a rapid first phase was followed by a relatively flat second phase. Also in line with previous reports [4, 7], GSIS was similar between WT and Gpr40 −/− islets. Interestingly, oleate potentiated preferentially the second phase of insulin secretion in WT islets, and at least half of this effect was eliminated in Gpr40 −/− islets. This is consistent with our previous observations that the second phase of insulin secretion is reduced by approximately 50% in Gpr40 −/− mice both in response to Intralipid  and during intravenous glucose tolerance tests following high-fat feeding . Overall, these findings suggest that approximately half of the stimulating effect of fatty acids on insulin secretion is mediated by GPR40, the other half being likely related to their intracellular metabolism [8, 27]. A model to explain the biphasic nature of insulin release induced by nutrients proposes that first-phase secretion is mediated by the release of a readily releasable pool of insulin secretory granules pre-docked at the plasma membrane, whereas the second phase of insulin release involves the transport of insulin granules from an intracellular reserve pool to the plasma membrane . Consistent with this model, intracellular granule transport is associated with remodelling of the actin cytoskeleton, and blockade of F-actin depolymerisation specifically reduces second-phase insulin secretion [37, 38]. Here we observed that fatty acids largely amplified the second phase of GSIS and that this was associated with a rapid and GPR40-dependent depolymerisation of F-actin. This suggests that GPR40 signalling regulates the actin cytoskeleton and, thereby, second-phase insulin secretion. In apparent contradiction with our results, a GPR40 agonist has been reported to potentiate both first- and second-phase insulin release . This discrepancy might be due either to differences between fatty acids and the agonist, or to the fact that in that study the islets were pre-treated with the agonist before the insulin secretion test, which might have ‘primed’ the pathway. GPR40 is thought to couple to Gαq/11, which classically activates PLC [5, 7, 20]. Although the rise in IP3 levels in response to fatty acids does not occur in Gpr40 −/− islets , the functional role of IP3 in the potentiation of insulin secretion by fatty acids remains unclear. In fact, the increase in the level of intracellular calcium in response to fatty acids appears to be due to modulation of ATP-sensitive potassium channel and L-type calcium channel activity rather than to the mobilisation of Ca2+ from ER stores [21, 40]. Thus, inhibition of the ER calcium ATPase pump, which leads to depletion of ER Ca2+ stores, does not prevent the rise in intracellular Ca2+ in response to oleic acid . In addition, inhibition of IP3-mediated Ca2+ release from the ER has no effect on the potentiation of insulin secretion by a GPR40 agonist . Here we showed that exogenous DAG mimicked the potentiating effect of oleate on insulin secretion in both WT and Gpr40 −/− islets. This is consistent with the possibility that DAG generation in response to GPR40 activation mediates most of the GPR40-dependent effects of fatty acids on insulin secretion, with only a minor contribution (if any) of the IP3 branch of the pathway (Fig. 7). PKD is a serine/threonine kinase initially described as an atypical PKC (PKCμ) but now classified as a subfamily of the Ca2+/calmodulin-dependent kinase superfamily . The role of PKD in beta cell function was first demonstrated by Sumara et al , who showed that PKD1 was negatively regulated by the δ isoform of p38 mitogen-activated protein kinase and promoted both insulin secretion and beta cell survival. Kong et al  further showed that PKD1 mediates insulin secretion in response to muscarinic stimulation. Here, we provide unique evidence that PKD is also activated rapidly, in a GPR40-dependent manner, in response to oleate. Further, pharmacological inhibition or deletion of the gene encoding PKD1 abrogates the potentiation of GSIS by oleate without significantly affecting GSIS itself. These results therefore demonstrate a key role for PKD1 in GPR40 signalling in response to fatty acids. One question that arises from these findings is: how is PKD1 activated in response to fatty acids? Our observation that exogenous DAG promotes PKD phosphorylation at both Ser-744/748 and Ser-916 suggests the involvement of a Gαq/11-dependent signalling pathway, PLC activation and DAG generation. In aortic smooth muscle cells, PKD is first activated by PKCδ-mediated trans-phosphorylation at Ser-744/748 . In beta cells, however, our [43, 44] and other  previous observations that glucose and phorbol ester-stimulated insulin secretion are unaltered by deletion or overexpression of a kinase-negative isoform of PKCδ, as well as the current results showing normal fatty-acid potentiation of GSIS in Prkcd −/− islets, suggest that PKCδ is unlikely involved, in this context, in trans-phosphorylation of PKD. Alternatively, it is possible that GPR40 signalling activates PKD via Gαq-dependent autophosphorylation [31, 46] or, as shown for M3-muscarinic receptor stimulation of insulin release, by G-protein-independent, β-arrestin-dependent activation . However, since exogenous DAG mimics the effect of oleate on PKD activation and insulin secretion, and since inhibition of Gαq/11 inhibits fatty-acid potentiation of GSIS , it is likely that GPR40 signalling involves a Gαq/11 -dependent pathway rather than a G-protein independent mechanism. A second question arising from our results is: how does PKD1 promote second-phase insulin secretion in response to fatty acids? In this regard, our finding that deletion of the gene encoding PKD1 in islets prevents oleate-induced F-actin depolymerisation is consistent with the observation that PKD phosphorylates several proteins that regulate F-actin remodelling in other cell types and control insulin secretion in beta cells, such as the small GTPase RhoA [47, 48] or p21-activated kinase [37, 49], although the nature of PKD1 targets in this particular context remains to be identified. In conclusion, our findings are consistent with the model depicted in Fig. 7 by which fatty-acid stimulation of GPR40, coupled to Gαq/11, results in the generation of DAG via PLC-mediated hydrolysis of membrane phospholipids, activation of PKD1, F-actin depolymerisation, and potentiation of second-phase GSIS. These observations provide valuable mechanistic information as GPR40 is being considered as a target for type 2 diabetes therapy and several GPR40 agonists are in the advanced phase of clinical development. This work was supported by the Canadian Institutes of Health Research (CIHR; MOP 86545 to V. Poitout) and the Canadian Diabetes Association (to P. E. MacDonald). M. Ferdaoussi is supported by fellowships from Diabète Québec and the CRCHUM. V. Poitout holds the Canada Research Chair (CRC) in Diabetes and Pancreatic Beta-cell Function. M. Prentki holds the CRC in Diabetes and Metabolism. P. E. MacDonald holds the CRC in Islet Biology and a scholarship from Alberta Innovates – Health Solutions (AI-HS). J. Kolic is supported by doctoral studentships from AI-HS and the CIHR. We thank: M. Ethier (CRCHUM) and G. Fergusson (CRCHUM) for valuable technical assistance; A. Smith (University of Alberta) for assistance with image analysis; D. C. Lin and H. Baribault (Amgen) for providing Gpr40 −/− breeders and M. Leitges (Biotechnology Centre of Oslo, Oslo, Norway) for providing Pkcδ −/− mice. V. Poitout has served as a consultant to Takeda and Merck Research Laboratories in the past 12 months. All other authors declare that there is no duality of interest associated with this manuscript. MF and VP designed research and wrote the paper. All authors contributed to acquisition, analysis and interpretation of data, revised the manuscript and approved the final version.